This long-wheelbase Model J has a “Beverly Sedan” body from Murphy. I really don’t know what “Beverly” refers to, but it was used on a few Model Js and a number of Cords. If anyone knows, please share. It is being offered as part of Barrett-Jackson’s second-annual “Salon Collection” (it even has its own website) at their Scottsdale auction in January. The car is coming from the Imperial Palace Collection where it has been on display for some time. Barrett-Jackson doesn’t publish pre-sale estimates and it’s hard to guess, as their prices are all over the place. I expect this car to either A. not meet its reserve or B. go for more than it should after the crowd is prodded by being told it’s “way under the money.” Watch and see. You can read more here. 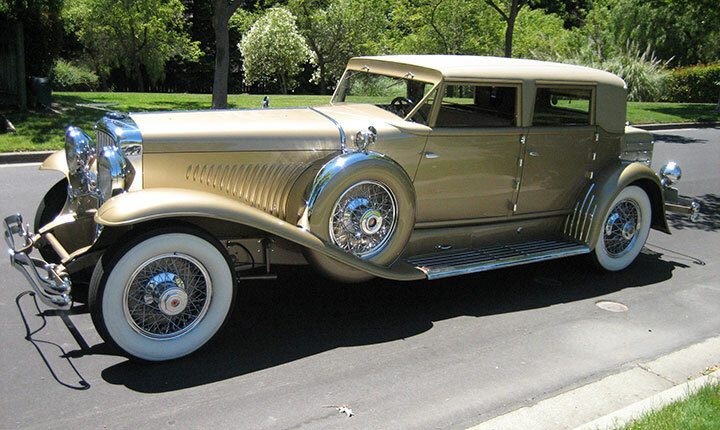 This entry was posted in Uncategorized and tagged 1934, auctions, barrett-jackson, beverly sedan, cars, classic cars, duesenberg, lwb, model J, murphy by classiccarweekly. Bookmark the permalink.